Water is one of the strongest elements in our planet. Not only does it occupy 70% of the earth, it also composes 75% of the human body. It has the innate capability to transform from solid to liquid to gas and therefore can be found absolutely everywhere. Water is calm, fresh, healing, relaxing, and at some point mysterious. It's that one element that holds every other element together.Together with the Air element, Water is responsible for the continuous ebb and flow of life; its unstructured movement imitating that of one's Chi. Oh and for everyone's information, Feng Shui literally means Wind-Water. 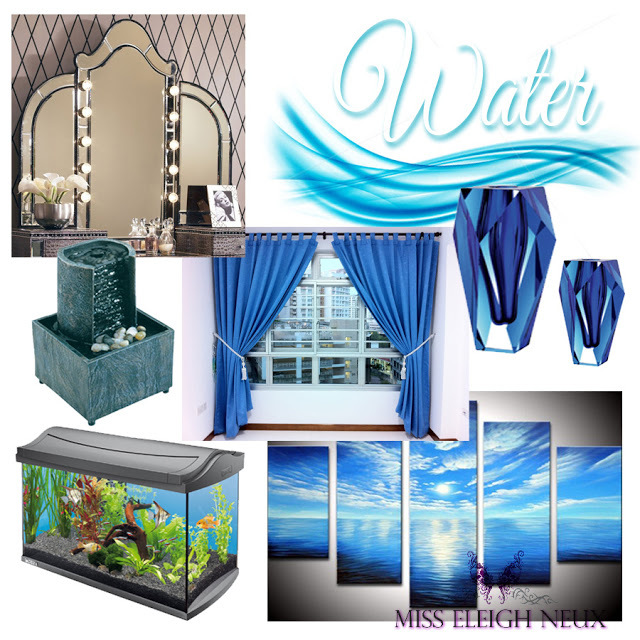 I don't think a room will ever be complete without a water element in it. Just imagine a house without windows, or a pool without water. Creepy right? FLOWING. Any object that is shaped with a continuous, flowing and sinuous pattern is said to be a water element regardless of the color. Curvy shapes and repetitive prints are also good examples. BLUE, SEAFOAM GREEN and BLACK. Obviously, anything colored blue represents the water element, may it be the walls, the linens or small room accents. From a light shade of blue conveying a calm, airy and free flowing energy to a cool seafoam green representing the fresh ocean breeze to dark blue and black toning down vibrant colors. REFLECTION. Mirrors, crystals and anything shiny are considered water elements. They direct the flow of energy where it needs be, and can increase objects in their reflection. You do not want to place a mirror in front of the desk where you manage your taxes, or even in your bedroom because it might keep on bouncing unintended energy when all you want to do is sleep. WATER. May it be in a form of a painting, a textile pattern, a curvy-shaped accent or furniture, or in its natural form, water is always the best example of a water element. Another example of good sources of water energy is in the form of aquariums and fountains. Make sure to place running, free flowing water if you're going to put actual water anywhere. It is so the energy will run freely around the room. BALANCE with EARTH. The exciting thing about this element is it's the primary attractor of wealth and prosperity. However, too much water element in a room can feel like a tidal wave that messes everything up. That's why one should never go overboard with this element and instead balance it well with the earth element. It limits the water element the way a dam prevents the river from flooding a town. Here's an infographic that sums up the Feng Shui 101 basics of the water element.